After trying to create a cloud of suspense and anticipation as thick as what NASA did a couple of weeks ago it’s time to get to it. Contrary to common practice i figured i might as well start off with a huge bang and not continue to take things slow. After all, there are about five people who might care anyways. So on a classic four count, 1-2-3-4… Hey! Ho! Let’s Go! Fast forward to a couple of weeks ago. Before going home from work i checked my stats on WordPress and noticed that i had a couple of hits on my previous post about the booklet. And that in turn made me go check when it was that i sent my last email, turns out it was late 2014 so i figured what the hell, it’s about time for another stab at it… As usual nothing came back but then about a week later there it was – a response! And what a response it was. After all of the hundreds of emails i sent out regarding The Summer Dancers negative replies have become standard procedure so i was both shocked and amazed to see an email that actually contained wording like “offer you a copy”. Nothing short of unbelievable, in a way i still can’t believe it. So…. what exactly is all the fuss about? 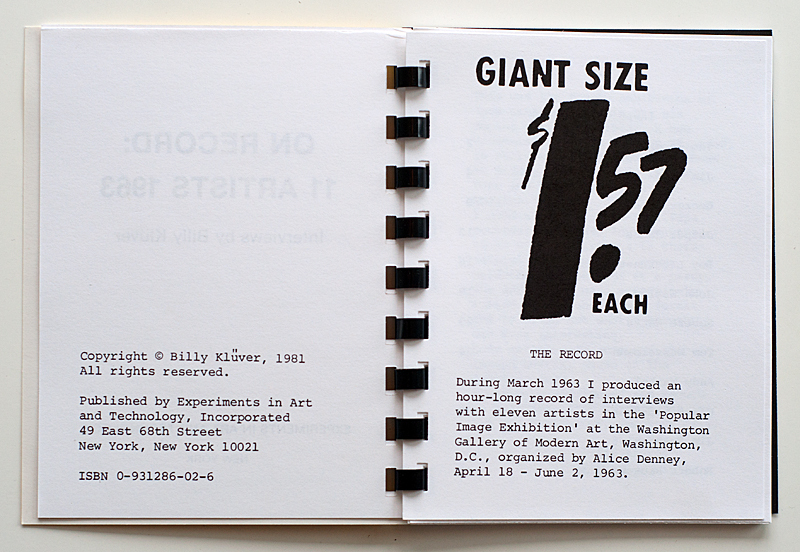 I don’t know very much about it but i guess you might call it a spin off to the iconic and incredibly rare cover/record – Giant Size $1,57 Each that was produced in 1963 in connection with The Popular Image Exhibition in Washington D.C. I don’t know enough about either the exhibition or the record cover so i’ll keep it short and sweet and stick to the basics. 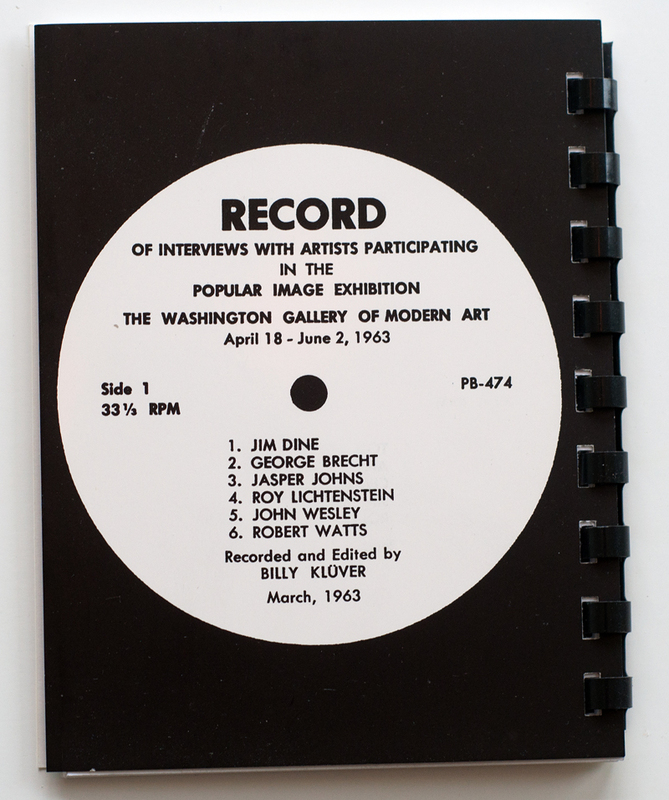 And the name of the item gives away it’s content fairly good, it holds interviews with 11 artists – Jim Dine, George Brecht, Jasper Johns, Roy Lichtenstein, John Wesley, Robert Watts, Tom Wesselmann, Andy Warhol, Claes Oldenburg, Jim Rosenquist and Robert Rauschenberg. 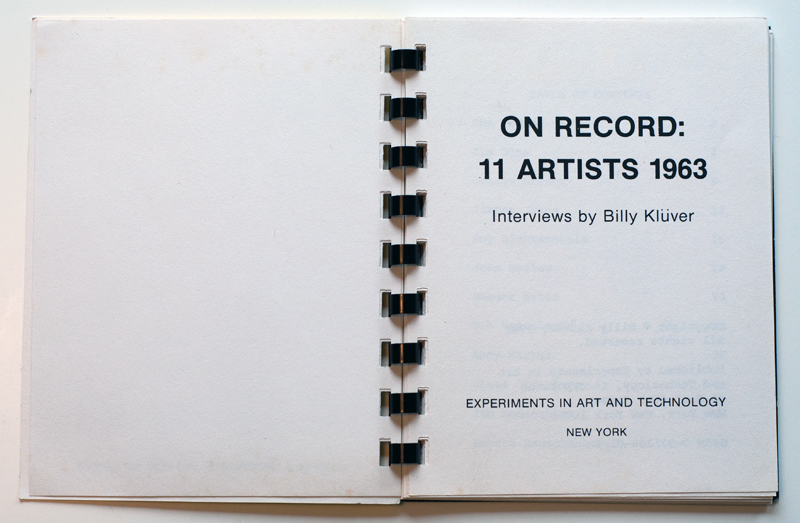 The interviews were all done by Billy Klüver and the booklet and cassette were produced as a later, alternative version to the LP and the reason was simply that Klüver wanted to to make the information available to another new audience since the record was out of production. 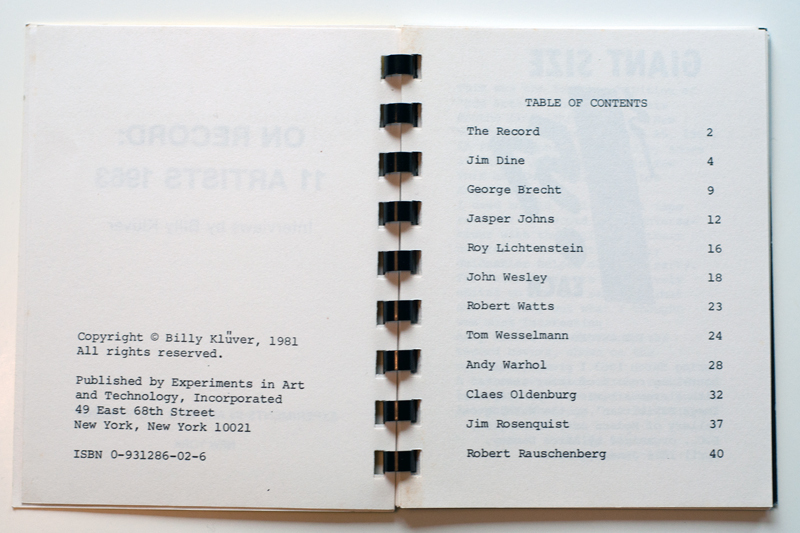 There is a signed and dated (at least by year) introduction kind of thing by Billy Klüver in the booklet with a mention that the cassette is available from the E.A.T. 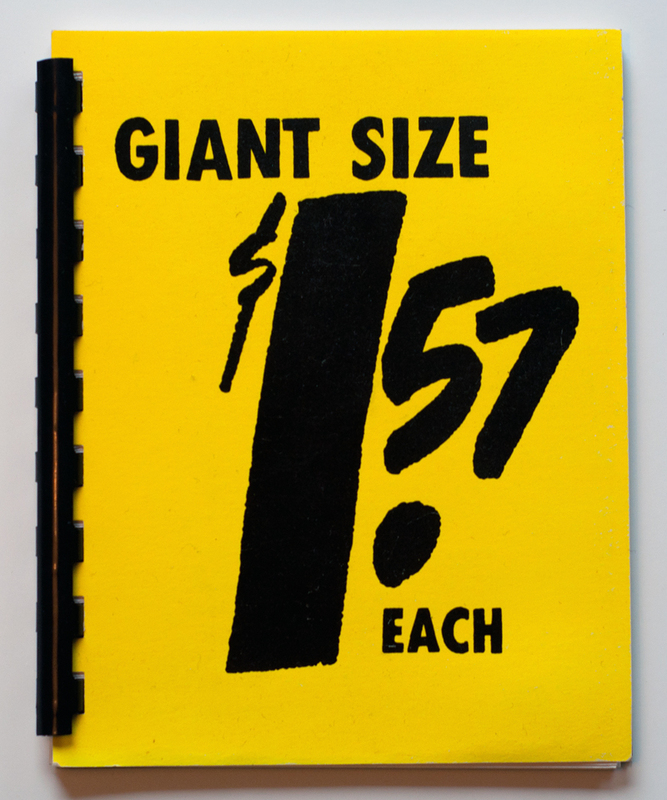 in NYC so to the best of my knowledge these were produced sometime in 1981. 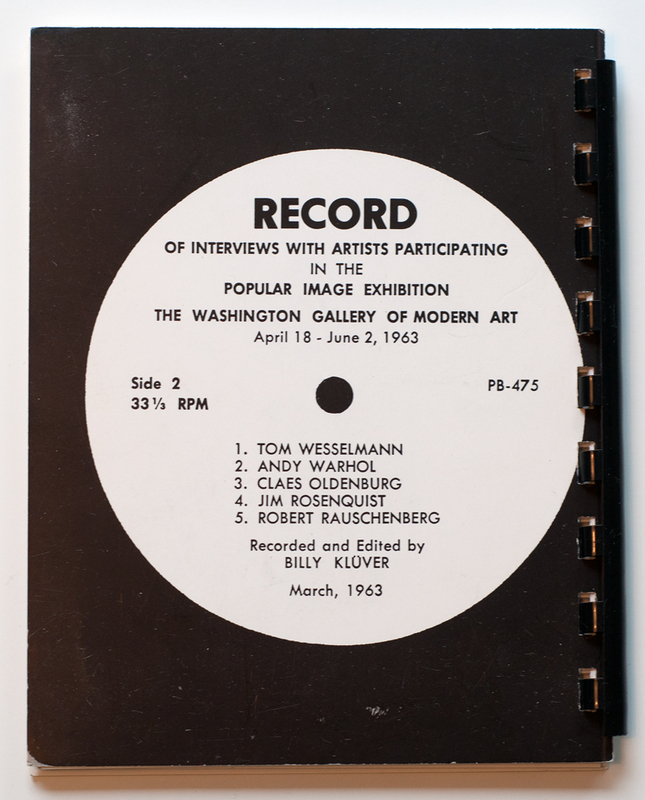 However, i learned from the seller that the booklet and cassette were produced and sold at the opening of The Andy Warhol Museum which from what i understand took place in 1994, so i don’t know what to make of it all. And it’s really not THAT important. What i do know is just how rare they are, and what i’ve learned from the seller is that there were initially 50 sets of cassettes and booklets produced. 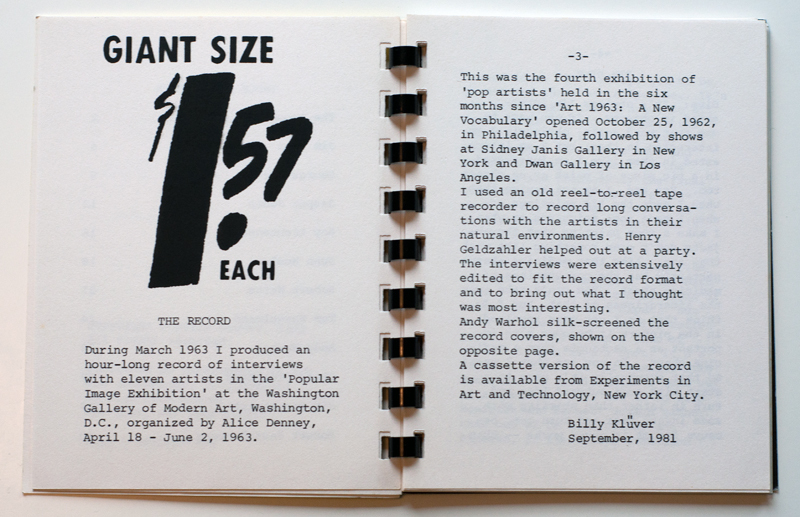 The booklet alone was then printed in greater numbers but apparently no more than 500 copies were produced. So yeah… both of these are pretty rare. And without question the cassette will take the place of the rarest item in my collection. I have an old cassette player around somewhere but i won’t risk playing this old tape so i’ll have to make do with reading the transcriptions in the booklet. Even though i was able to get some information straight from the source there are still a couple of intriguing things though. First, and this in minor, there is a sligt difference when it comes to the label on the cassette. My copy has “Side One” and “Side Two” printed below the title and on Guy’s copy (as with the one in the images on Discogs) these are printed on the side of the label or whatever. Not a thing that i will lose a lot of sleep over, but still pretty interesting. If nothing else it must mean that the labels were printed on at least two different occasions? And then to real mystery… on the side of the cassette the number “64” is printed so it appears we have a LOST style number mystery on our hands. I first i thought of the obvious – that they were in fact numbered. But then Guy told me his had the same number so that sent that theory out the window. The seller didn’t know for sure but made a guess that it might relate to the lenght of the tape. 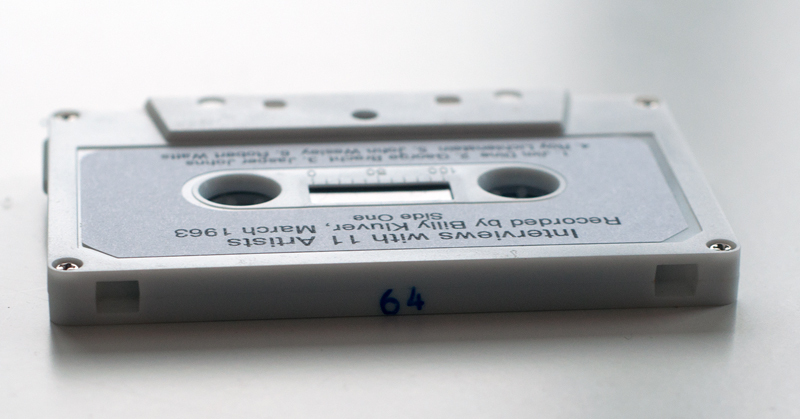 I’ve been forced to read up a little bit on the compact cassette format and it seems that the standard lenghts were 30 or 45 minutes per side and these were labeled C60 and C90. From what Wikipedia has to say there seems to a lot of other, less common capacities but there is no mention of C64. In fact, bascially the only stuff you’ll find on that are hits for the Commodore 64 computer and the tapes used for that. So i don’t know… i can’t say that i’m totally convinced it has something to do with the lenght after all. 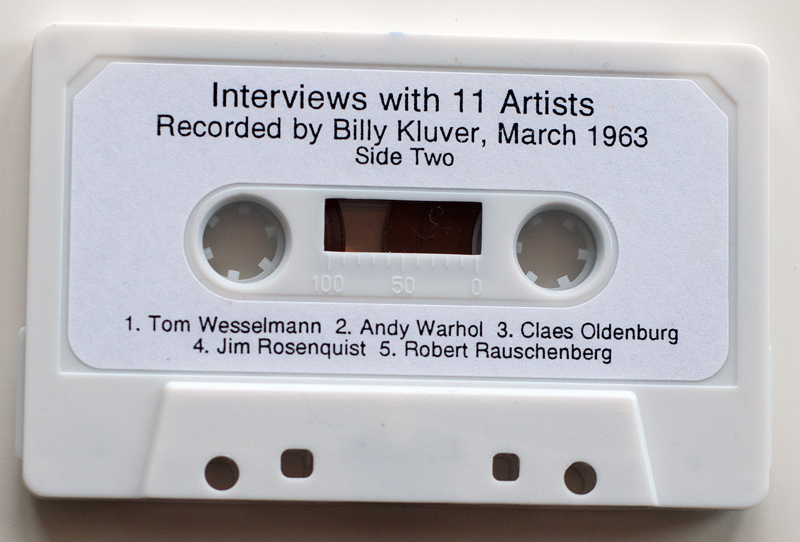 The number also appears to be stamped on the cassette and not printed beforehand, would Klüver really care enough to time it all and then stamp them in this way? 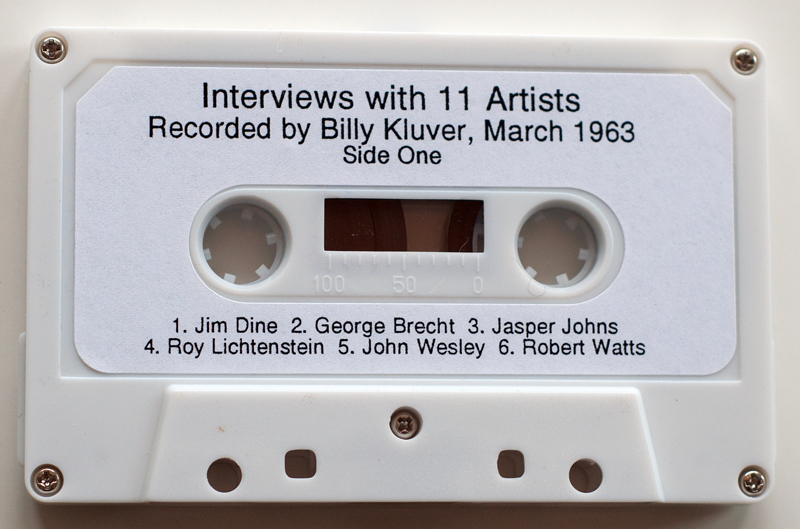 I don’t have much of a better suggestion as to the meaning myself, one thing caught my interest though and that’s the fact that the cassette was introduced in the US in 1964, but i don’t know… Interesting and intruiging, though not important. This was without a doubt the best find of the year, at least for a couple of days… I’m hoping the new number one will be shipped in the days to come, so as promised there are more cool things coming up! I always say i’m collecting on a budget. And this is mostly true. I will probably never get my hands on a Cool Gabriels, Trombone by Three or The Joke/Chase the Dragon to name a few… But every now and then i get my eyes on something that make the “must have” monster start to grow inside me. The Ratfab single was one of these occasions and about a week or two ago it happened again. 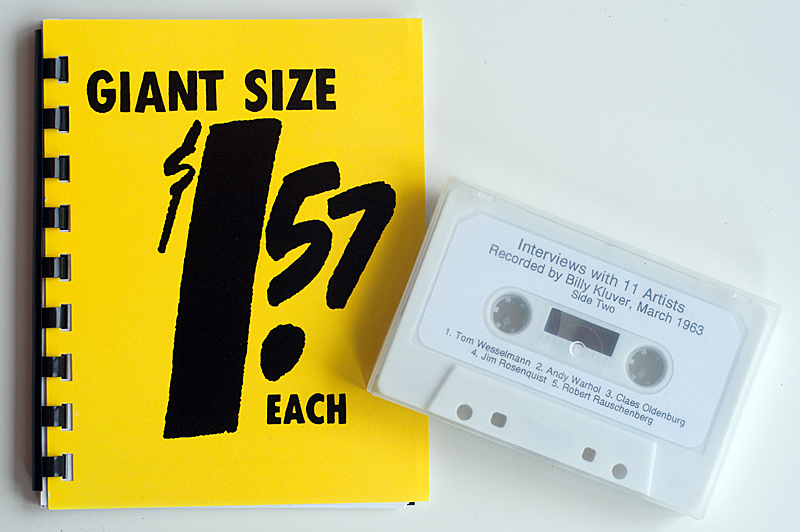 Some random searches for some general information on the Giant Size $1,57 Each cover brought me to the discogs page for the cassette with the interviews. Then for some reason, i hardly ever do this, i looked at the additional images. 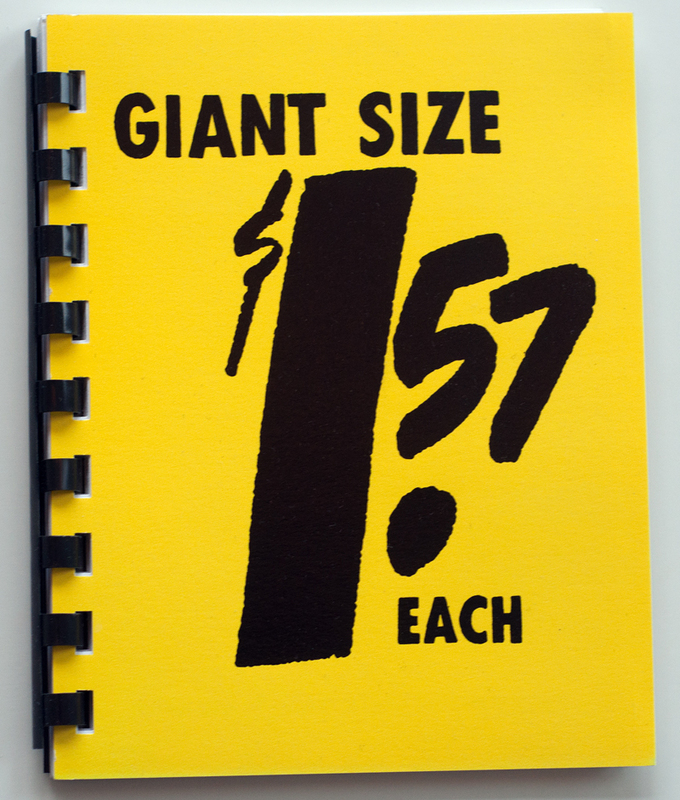 And there was two or three images of what looked like a spiral bound booklet or notepad with a very familiar cover. 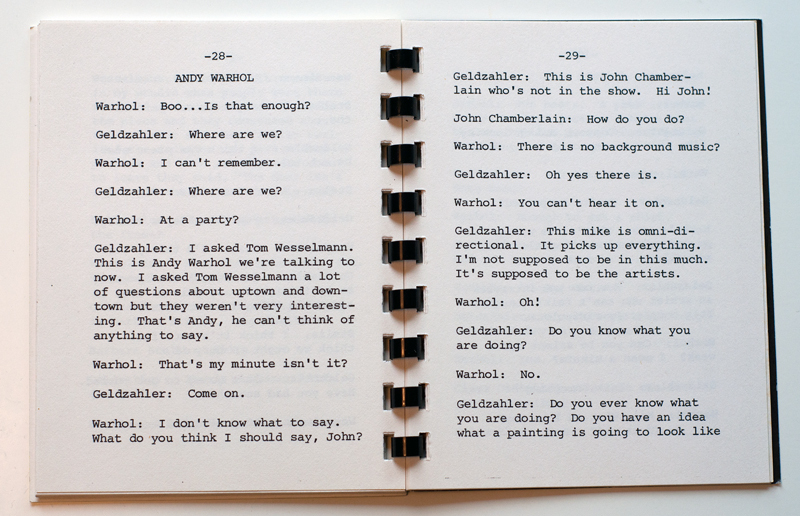 Am i crazy to think that Warhol maybe gave permission for the design to be used for the cover of this? I find it hard to find any information at all about this item so who knows… Whatever the case i think it’s a great complement to the record covers i got from Richard Forrest. I might never find the audio to this but if this is as close as i will get that’s good enough. It’s also a very nice “crossover item” to have included in my album covers/book collection. It’s in great condition also, just the sliiiiiightest of some kind of discoloration on the bottom 1cm on the first 2-3 pages but this is far from major. Generally in TOP condition and i’m very happy about finding this thing!